Stretches the plantar fascia and Achilles Tendon to help relieve pain and speed healing of Plantar Fasciitis or Achilles Tendonitis. 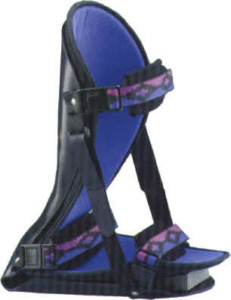 Adjustable straps control foot flexion (10 to 30 degrees), and three padded straps with lock buckles keep splint in place. Flexible plastic construction with soft, moisture wicking liner. Not for ambulatory use. Fits right or left. Antimicrobial protection. Non-slip bottom - Not intended for ambulation, but helps prevent accidental slipping on flooring. The HealWell Night splint is designed to comfortably position the foot in a controlled amount of dorsiflexion to provide a gentle stretch to the plantar fascia and Achilles Tendon. This gentle stretch helps reduce the muscle contracture, inflammation and associated pain. It has also been clinically proven to reduce symptoms of plantar fasciitis. Three strategically placed comfortable padded straps. Removable foam wedge provides additional toe extension. Removable C3 liner with Orthowick to help wick moisture into the Microban foam inner layer. Made of spring-action plastic with ventilated calf area to allow for comfort and breathability. Open, cut heel design allows for the foot to be comfortably and properly positioned.